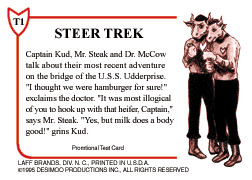 Description: The Steer Trek Laff card was done as a contest entry for a "create your own trading card" contest in a 1995 issue of the Wrapper. 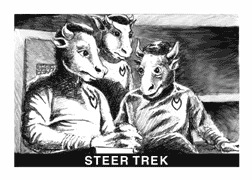 This card was done as a parody of the Star Trek Leaf cards produced in the late 1960's. Only 650 cards have been produced. Each card is hand numbered and signed by the artist.